Located in a quiet corner of the former graveyard of St. Nicholas’ Church, Kyloe. 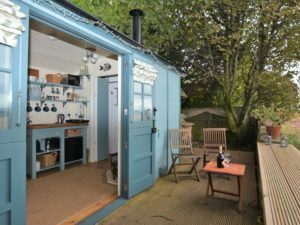 The Good Shepherd’s Hut provides all the conforms of home. It is blessed with spectacular views and a peaceful, private location, and despite being small on the outside it is fully equipped with log burner, mini kitchen, smart TV, wifi, DVD, player ensuite and a big comfortable bed.